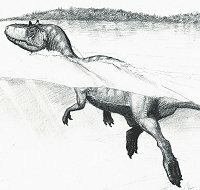 A university of Alberta team under the supervision of Phil Currie have been busily excavating a new dinosaur bone bed in south-west Edmonton, Canada. A bone bed is formed when the remains of a lot of animals end up being preserved together, in this case the bone bed consists of mixed herd of Hadrosaurs (duck-billed dinosaurs). According to initial reports the majority of the fossil bones so far have been identified as belonging to a Hadrosaur called Edmontosaurus, this was one of the largest type of duck-billed dinosaurs and believed to be one of the last kinds of duck-billed dinosaur to evolve. Sharing the bone bed are the remains of another giant duck-billed dinosaur, a Saurolophus. Interestingly, palaeontologists used to believe that these animals lived at different times, but finding them together in this bone bed indicates that they were contemporaries. Although the dinosaur dig has hardly got going, it is hoped that perhaps as many as 20 complete Hadrosaur skeletons will be removed. 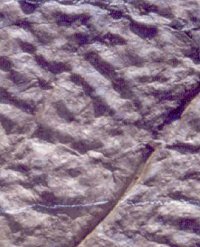 Some of the fossils show evidence of feeding, it looks like Phil Currie and his team are not the first to come across the remains of these plant-eaters. Teeth marks on some of the bones indicate that a big Tyrannosaur (possibly a Daspletosaurus) fed on the carcases. Edmontosaurus is believed to have been capable of growing to more than 40 feet in length and weighing over 5 Tonnes. Bone beds are very important as they can provide a great deal of information about a species with so many animals being preserved together. How these Hadrosaurs met there doom can be speculated upon. The fossils date from around 70 million years ago (late Cretaceous) and it is believed that perhaps a sudden change in local climate, perhaps a drought caused a number of types of plant-eater to migrate in such of food. Perhaps they died trying to cross a river, or perhaps the drought continued and the animals starved to death. The stratigraphy (the surrounding rocks), will provide vital clues permitting scientists to piece this puzzle together. Dinosaurs and Wimbledon Tennis Championships! It may seem odd to put the words “Dinosaur” and “Tennis” in the same sentence, especially when dinosaurs have been extinct for millions of years – but a very famous dinosaur called Stegosaurus and the Wimbledon Lawn Tennis Championships do have something in common. This year, 2007, marks the 130th anniversary of the describing of the most famous and best researched of all the Stegosaurs – Stegosaurus. This Stegosaurus species was first described in 1877 by the American palaeontologist Othniel Charles Marsh. Stegosaurus means “roofed lizard”, as the bony plates found with the fossil reminded Professor Marsh of roof tiles. Coincidentally, 1877 was the year of the first Lawn Tennis Championship at Wimbledon. Both Stegosaurus and Wimbledon are 130 years old! Although most people can recognise Stegosaurus (it regularly features in the top 5 of our popular dinosaur surveys), this animal has only been known to science for 130 years. Dinosaurs are so prevalent in our everyday lives, what with films, books, comics and TV we forget how young the science of palaeontology is. Stegosaurus may be one of the best known extinct creatures but we are still finding new types of Stegosaur and we still have a lot to learn about this particular group of dinosaurs. There were many different types of Stegosaur, perhaps the best known is Stegosaurus stenops from the Upper Jurassic Morrison formation of North America. This was an impressive animal with its large over-lapping plates and reaching a length of 9 metres, about as long as a bus. Ironically, the over-lapping plates on this animal, so often depicted in the movies is not a common characteristic of this group. Most other Stegosaurs have both plates and tail spikes arranged along their mid-line in pairs. Most Stegosaurus models are of S. stenops although the largest Stegosaurus known to date is Stegosaurus armatus. This animal may have weighed more than 3 Tonnes, like S. stenops it too lived in the Late Jurassic and was described by Othniel C. Marsh. Like many dinosaurs, Stegosaurus has suffered from a poor press. Often it is depicted as slow moving and clumsy with a brain no bigger than a walnut. It certainly wasn’t the brightest of dinosaurs, but it was well equipped to survive the Jurassic and into the Cretaceous and Stegosaur fossils have been found all over the world. Models of Stegosaurus have changed as scientists perception have changed. For example, some models of Stegosaurs show them as deep bodied animals and looking rather clumsy. Stegosaurus fossils still have a lot to reveal to us, for example we don’t know why the group lost toes on its rear feet (ending up with just three) but retained a “full hand” with five toes on the front feet. Scientists still are not sure just how the plates were used and there is still a debate going on as to whether or not Stegosaurus could rear up onto its hind legs to feed – using its tail as prop. Unlike other bird-hipped dinosaurs (ornithischians), Stegosaurs did not seem to possess ossified tendons that reinforce the spine. These features, found in all other bird-hipped dinosaurs helped keep the tail straight and support the back. The lack of these ossified tendons would certainly have given Stegosaurus a very flexible tail. Just the thing needed as the spikes on the tail could be swung to make a very effective weapon. If threatened, a Stegosaurus could thrash its tail both backwards and forwards and with spikes up to 1 metre long in some species this would have made an effective deterrent. Indeed, it is thought that Stegosaurs could swing their tails with much the same easy motion as top athletes could swing a tennis racket with fore-hands and back-hands. Looks like we are back to the Tennis again. One of the more common members of the Late Cretaceous mega fauna of North America was Edmontosaurus. Edmontosaurus (E. regalis), is known from several hundred fossil skeletons, including some that have internal organs and skin impressions associated with them. A large herbivore, the biggest fossil specimens indicate that this dinosaur could reach lengths in excess of ten metres and it perhaps weighed more than five tonnes.